An almost gossipy look of the men who made some of the most significant discoveries in Western medicine. 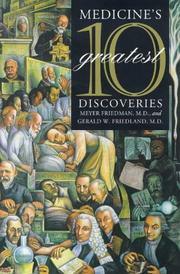 Friedman and Friedland, two physicians whose combined careers encompass over a century of teaching and practicing medicine (Friedman discovered the effect of Type A behavior on the heart), selected their own top ten and then had them vetted by antiquarian book dealers and physician-collectors of rare medical publications. Chronologically, the anatomical observations of Vesalius come first: his Fabrica (published in 1543) was, according to Friedman and Friedland, “so scientific that it initiated medical science itself.” However, they rate Harvey’s discovery of the circulation of the blood in the human body as the single most important, because it introduced the principle of experimentation in medicine. Leeuwenhoek is included as the founder of bacteriology, Jenner for introducing vaccination, Crawford Long for the initial use of surgical anesthesia, and Roentgen for discovery of the X-ray beam. Nearly unknown today are Ross Harrison, who first grew living tissue in culture outside an organism, and Nikolai Anichkov, who discovered the primary role of cholesterol in atherosclerosis. Fleming is credited with the discovery of penicillin, but Florey’s role in its development is not overlooked. Similarly, the DNA story gives primary credit to Wilkins, while clarifying the role of Watson and Crick in elucidating its structure. In recounting the story of these achievements, the authors devote considerable space to the character and private lives of the men who made them. One’s arrogance, another’s dullness, their mistaken notions (Harvey believed in witches; Fleming thought of penicillin as simply an external germicide), their good luck and bad marriages, their ambitions—all are revealed. The authors conclude that it is not genius so much as curiosity and the ability to conduct a methodological investigation that distinguish them. While Friedman and Friedland’s list of the ten best is sure to be questioned, their revealing portraits of notable men of science are memorable.